Spoilers! 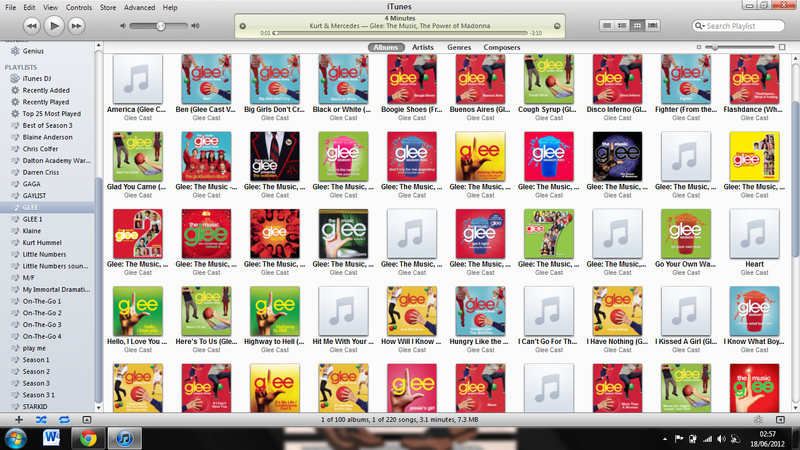 3x01, Kurt, Rachel, Mercedes, Santana and more! Like a teenager who had a growth spurt over the summer, the Season 3 premiere of Glee boasts a dizzying amount of changes. At a screening on Thursday in Los Angeles, creator Ryan Murphy handily shared some spoilers, such as the possible return of Gwyneth Paltrow in her Emmy-winning role as substitute teacher Holly Holliday; the Episode 2 return of Broadway star Idina Menzel as Shelby, Rachel’s biological mother and adoptive mom of Quinn and Puck’s baby; and a two-hour tribute in the spring. Most important, Glee will focus this season on the core characters as they prepare to graduate, he said. For instance, Canadian Vanessa Lengies, who plays new student Sugar Motta, "will be used sparingly … as great flavour, as spice," he said. Murphy also dropped some major storyline spoilers – stop reading now if you don’t want to know! Will and Emma are living together. Finally. But they’re not doing the horizontal jog. And Will is mighty frustrated. Quinn has chopped off her hair, dyed it cotton-candy pink (as seen in the promos), wears black nail polish, chain smokes, has quit New Directions and joined a girl gang called the Skanks. “You look like a Jolly Rancher fell in an ashtray,” Brittany (Heather Morris) bleats. The charismatic Blaine leaves his private school and The Warblers to join Kurt, his one and only love at McKinley High. But are they destined to duel at New Directions? Meanwhile, Kurt and Rachel (Lea Michele) realize they must pump up their resumés to compete for enrollment at a New York City drama school. So Kurt runs for class president. And Rachel suggests the school mount West Side Story. Naturally she expects to play the lead, Maria. But Mercedes (Amber Riley) isn’t having it. Murphy said Mercedes will no longer be in Rachel’s shadow. (It’s about time – that woman has pipes.) Mercedes, last seen snuggling up to Sam (Chord Overstreet), has a new beau – a football player as wide as a door. Mercedes explains matter-of-factly that Sam’s dad was transferred out of state. Will kicks Santana out of glee club because she’s allied with Sue Sylvester (Jane Lynch). Sue, depressed last season after her sister died, is reinvigorated by her campaign for Congress. Her platform? Slashing funding for the arts … including all glee clubs. Glee Project co-winner, Damian McGinty from Ireland, will appear in Episode 6 as a foreign exchange student. “He’s shacking up with Brittany,” Murphy revealed,” and “she thinks he’s a leprechaun with magical powers. It’s great fun.” The other winner, Samuel Larsen, will play Puck’s (Mark Salling) relative and is scheduled for Episode 10 or 11. The writers were playful when they created a cameo for runner-up Lindsay Pearce. She gloats to Rachel in Episode 1 that she’s “been acting since she was in utero” when an ultrasound of her appeared on Murder She Wrote. And then she sings spectacularly. Ryan said one of his favourite moments was the meeting between Lea and Lindsay. “I love where she [Lindsay] gets in Lea’s face. I believe people would love to see catfights between them onscreen.” Yup.